Haulaway Storage Containers offers delivery, placement, and pick up of a rental roll off container in San Francisco. Whether you need a single container for a few days or an entire fleet of containers for a long term project, Haulaway has what you need and it can be yours with just one phone call. We have offices throughout the Western United States, and are proud to have grown our company while maintaining friendly and organized customer service. When you need a roll off container for rent, make Haulaway Storage Containers your first call. We are confident that our great product selection and service will make us your choice for all your temporary storage needs. Haulaway offers only durable, rugged, and secure steel storage containers. However, we recognize that every client and project is different, so we offer many different sizes. From ten foot long containers that are perfect for small jobs and homeowners, to forty foot long shipping containers that meet the needs of any large construction project, Haulaway has it all. Whether a conex cargo container or roll off container is right for your project in the greater San Francisco area, Haulaway can have it delivered to your job site and placed exactly where and how you want it. Ready to get started? Give our office a call, or browse our great product selection online. Haulaway has a huge selection of roll off containers available for rent without advance notice. Our office at 1995 Republic Avenue in San Leandro is the primary service hub for the Bay Area, including San Francisco. However, with our Rancho Cordova office under two hours away, we have additional inventory that we can draw on to fill large orders with no waiting or substitutions. 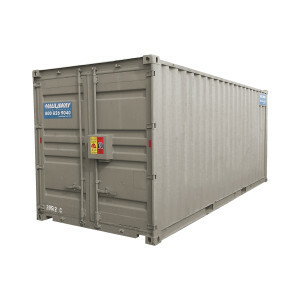 Haulaway Storage Containers offers personal service and also a large supply of quality products. If you are looking for a roll off container rental in the San Francisco area, choose Haulaway today! Whether your order is big or small, we have you covered with our quality shipping containers.